Two of NASA's Great Observatories, bolstered by the largest ground-based telescopes around the world, are beginning to harvest new clues to the origin and evolution of galaxies. It's a bit like finding a family scrapbook containing snapshots that capture the lives of family members from infancy through adolescence to adulthood. "This is the first time the cosmic tale of how galaxies build themselves has been traced reliably to such early times in the universe's life," said Mauro Giavalisco, head of the Hubble Space Telescope (HST) portion of the survey, and research astronomer at the Space Telescope Science Institute (STScI) in Baltimore. The HST has joined forces with the Chandra X-ray Observatory to survey a relatively broad swath of sky encompassing tens of thousands of galaxies stretching far back into time. The Space Infrared Telescope Facility (SIRTF), scheduled for launch in August, will soon join this unprecedented survey. 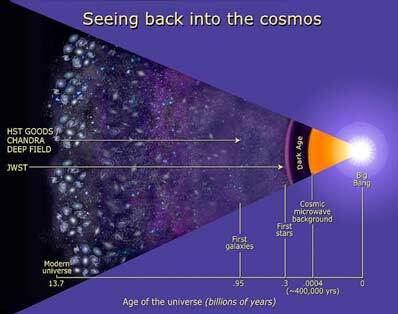 Called the Great Observatories Origins Deep Survey (GOODS), astronomers are studying galaxy formation and evolution over a wide range of distances and ages. The project is tracing the assembly history of galaxies, the evolution of their stellar populations, the gusher of energy from star formation and active nuclei powered by immense black holes. 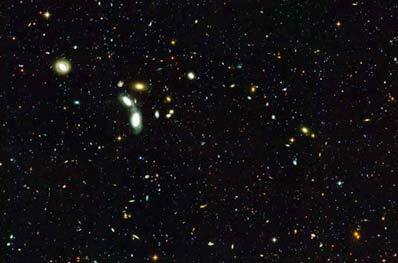 HST astronomers report the sizes of galaxies clearly increase continuously from the time the universe was about 1 billion years old to an age of 6 billion years; approximately half the current age of the universe, 13.7 billion years. GOODS astronomers also find star birth rate rose mildly, by about a factor of three, between the time the universe was about one billion years old and 1.5 billion years old. It remained high until about 7 billion years ago, when it quickly dropped to one-tenth the earlier "baby boomer" rate. This is further evidence major galaxy building trailed off when the universe was about half its current age. This increase in galaxy size is consistent with "bottom-up" models, where galaxies grow hierarchically, through mergers and accretion of smaller satellite galaxies. This is also consistent with the idea the sizes of galaxies match hand- in-glove to a certain fraction of the sizes of their dark- matter halos. 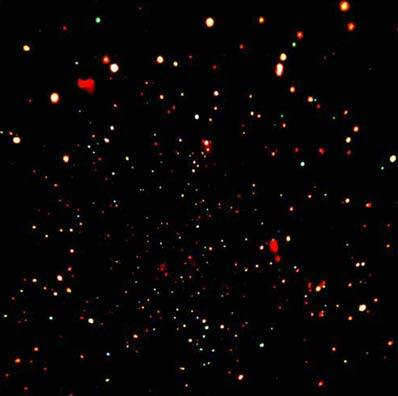 Dark matter is an invisible form of mass that comprises most of the matter in the universe. The theory is dark matter essentially pooled into gravitational "puddles" in the early universe, then collected normal gas that quickly contracted to build star clusters and small galaxies. These dwarf galaxies merged piece-by-piece over billions of years to build the immense spiral and elliptical galaxies we see today. The Chandra Deep Field-North image was made by observing an area of the sky over half the size of the full moon for 23 days. It is the most sensitive or "deepest" X-ray exposure ever made. By combining the Chandra and Hubble data for this field, astronomers can take a census of the fraction of young galaxies that contain active supermassive black holes back to a time when the universe was only about one billion years old, less than 10 percent of its present age. The data show that these very distant supermassive black holes are rare, more so than some expected. Credit: NASA/CXC/Penn State/D.M. Alexander, F.E. Bauer, W.N. Brandt et al. The Chandra observations amounted to a "high-energy core sample" of the early universe, allowing us to "study the history of black holes over almost the entire age of the universe," said Niel Brandt of Penn State University, a co- investigator on the Chandra GOODS team. One of the fascinating findings in this deepest X-ray image ever taken is the discovery of mysterious black holes, which have no optical counterparts. "We found seven mysterious sources that are completely invisible in the optical with Hubble," said Anton Koekemoer of the STScI, a co-investigator on both the HST and Chandra GOODS teams. "Either they are the most distant black holes ever detected, or they are less distant black holes that are the most dust enshrouded known, a surprising result as well." When comparing the HST and Chandra fields, astronomers also found active black holes in distant, relatively small galaxies were rarer than expected. This may be due to the effects of early generations of massive stars that exploded as supernovae, evacuating galactic gas and thus reducing the supply of gas needed to feed a super massive black hole.